In 2015, Iteca Caspian plans to hold 19 specialised exhibitions and 2 conferences covering many areas of the country’s economy. The exhibition season will open with AITF, Azerbaijan International Travel and Tourism Fair; HOREX Caucasus, Hospitality Fair; and CIBS, Boat and Yacht Show demonstrating the latest destinations and services ahead of the summer tourist season. The baton will then be passed on to the TransCaspian transport exhibition and the Road&Traffic road construction exhibition, which will both take place from 12 – 14 May. Due to Azerbaijan’s Year of Agriculture, the WorldFood Azerbaijan food industry exhibition and Caspian Agro agriculture exhibition, taking place from 12-14 May, are experiencing an increase in interest with 250 companies. The Caspian Power exhibition and the largest specialised exhibition and conference on energy in the region, the 22nd Caspian Oil and Gas (2-5 June), are the best places for evaluating energy market players. After a short break, the autumn exhibition season will open in September with international exhibitions on healthcare - BIHE, beauty and aesthetic medicine - Beauty Azerbaijan, heating and ventilation - Aqua-Therm Baku, security - CIPS Caspian, environmental technologies - CTE, telecommunications – Bakutel, Education, Career and BakuBuild. Having been very successful in 2014, CATEC and ADEX will take place again in 2016 as originally planned. Trade and industry exhibitions are a reliable guide to the business world, and the most effective tool for finding new clients, markets and widening the sales area, establishing international partnerships, increasing the flow of investment. They are a great opportunity to maintain relationships with partners and a target audience. The principle that ‘he who is not at the exhibition is not in the market’ is becoming more and more relevant. A number of leading companies have already confirmed their participation such as Azersun Holding, BP, Huawei Technologies Investment Co Ltd, Grow Group, Matanat A, RussNeft, Saipem and others. Sponsors of the exhibitions and conferences this year include AZFEN J.V., Azeri M-I Drilling, Baker Hughes, Bos Shelf, Caspian Drilling Company, Caspian Geophysical, Caspian Marine Services, Cross Caspian, Global Energy, Grand Motors, Gazakh Cement Plant, Inpex, NB Group, Schlumberger, SOCAR, Stadler, TPAO, Tekfen Construction, Total and others. Iteca Caspian’s 2015 partners include Seaport Catering, the catering partner; Safe Life, the safety partner; tour operators Greenwich Travel Club; the official hotels Jumeirah Bilgah Beach Hotel Baku and Qafqaz Point Hotel; and official stand builder AzExpoMontage. As usual, the exhibitions will all take place at Baku Expo Centre. A range of services will be available for exhibitors and visitors including a free shuttle bus service between the Koroglu metro station and Baku Expo Centre. The exhibition centre will have a business and press centre for exhibitors, a café and restaurant. This year, Iteca Caspian introducing a plastic visitor card to provide free access without registration through a separate turnstile entrance. The card will provide additional services such as access to the VIP lounge, the business centre, seminars and other additional events. The Fast Track online visitor registration service, which turned out to be very successful last year, will be used again. Over 30% of visitors chose to use Fast Track in 2014. Requiring only a few minutes, the process significantly saves time when registering at Baku Expo Centre. Electronic registration will soon be available via a smartphone application for Android and iOS. These services will allow visitors to efficiently use their time at the exhibitions. You can find more information at www.iteca.az and on the exhibitions’ official social media pages. 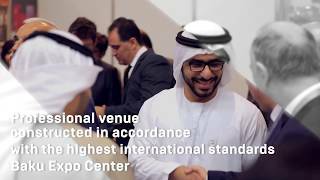 The exhibitor composition and the fact that they have continued to participate over many years attests to the exhibitions’ quality and success. 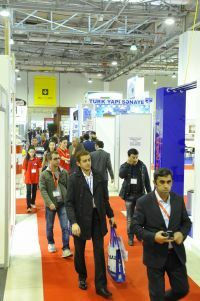 Companies that had exhibited with a small stand are increasing their stands for next year. All this is a clear indicator of how effective participating in trade exhibitions is. The exhibition organiser’s main aim is to support industry state structures that demonstrate the role and place of exhibitions in the country’s economy. Ilham Aliyev, the President of Azerbaijan has visited a range of exhibitions (AITF, WorldFood, Caspian Agro, Caspian Oil and Gas, Bakutel, ADEX) and saw for himself the latest achievements of companies. Local and foreign media’s broad coverage of the events, featuring companies’ services, products and innovations, helped to attract even more visitors. The organisers, ITE Group, hope that the 2015 exhibition year will act as a guide to the world of innovations and new technologies and as an aid in getting to know leading market players throughout the world, not simply meeting them and their products and services, but shaking hands and becoming one of their successful partners.